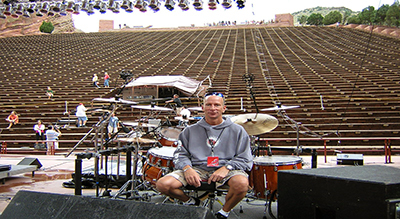 The amazing Red Rocks Amphitheater to Portugal Joe has toured the world with Esteban. When it came time for Esteban to do select dates with an 80 piece orchestra featuring some of the best orchestral musicians in the world he didn’t hesitate to make sure Joe was right by his side. Members of the New York Philharmonic, London Symphony, Boston Symphony and many more were lead by famous pops conductor Robert Moody playing the music of Esteban. The concerts were a huge success and more tour dates are planned for a PBS Television Special. 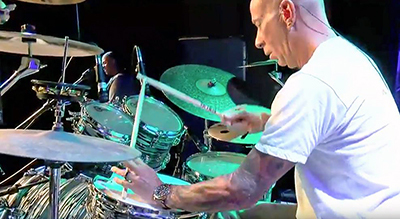 Joe has been with Esteban for over 25 years in concert, on television, infomercials and in the studio. They continue to tour together. Cutting my musical teeth in Philadelphia for many years in non drum related news I am so happy that the Philadelphia Eagles won a Super Bowl. My 50 year wait is over!!! I am so thankful it happened in my lifetime. GO BIRDS!!! This year is looking like another blessed year for me. I am touring with Esteban for the 28th year. That’s a good run in this business and really quite amazing. We will be traveling from Cabo to Europe with tons of U.S. dates. I will still be throwing down with some famous DJ’s this year check the tour page for dates. Those shows are always crazy. When I’m not touring I have been doing recording sessions pretty much everyday either at the Conservatory or for independent artists. All Joe’s solo CDs are available on iTunes, CD Baby, and other music sites for digital download. Joe has been the music director at this audio recording school for over 25 years. 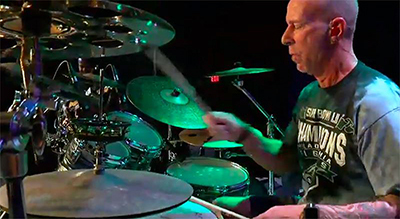 When he’s not on the road you can find him in the studio 5 days a week playing various drum clinics, band clinics, surround sound clinics, digital clinics, overdub clinics and broadcast clinics for students from all over the globe. The music will vary from funk, jazz, hip hop, soul, rock, latin, R&B, rap and hand drum clinics in 5.1 Surround Sound. Only a drummer with Joe’s versatility could tackle a job like this plus the scheduling of all the musicians at two locations. He takes great pride in his work at the Conservatory and offers the students his studio and product knowledge on a daily basis.